Although the mechanical management of impacted teeth is a routine task for most orthodontists, certain impactions can be frustrating, and the esthetic outcome can be unpredictable if the surgeon uncovers the impacted tooth improperly. When referring a patient to have an impacted toothuncovered,theorthodontist might assume incorrectly that the surgeon knows which surgical procedure to use. However, if not instructed properly, the surgeon could select an inappropriate technique, leaving the orthodontist with the difficult if not sometimes lengthy and challenging task of erupting the impacted tooth into the dental arch. On the other hand, if the correct uncovering technique is chosen, the eruption process can be simplified, resulting in a predictably stable and esthetic result. This is especially true for impacted maxillary canines. After the third molars, the maxillary canines are the most commonly impacted permanent teeth. About one third of impacted maxillary canines are positioned labially or within the alveolus, and two thirds are located palatally. In most situations, the appropriate timing and surgical procedure for uncovering an impacted canine are determined by specific criteria. 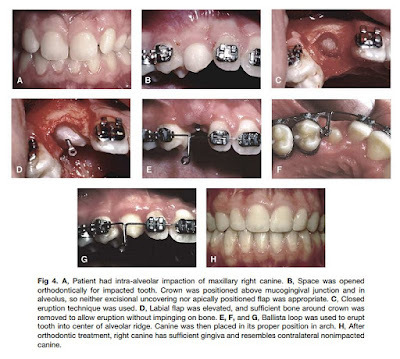 This article will review the surgical and orthodontic management of impacted maxillary canines.